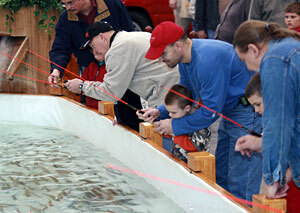 The Ultimate Sport Show in Grand Rapids, March 15 to 18, has everything! GRAND RAPIDS – When Michigan’s oldest and largest outdoor sport show comes to town, spring is never far behind. From March 15 to 18, show fever becomes spring fever for thousands of outdoor enthusiasts at DeVos Place, 303 Monroe St. NW in downtown Grand Rapids, during the 67th running of the Ultimate Sport Show. First held in 1946, this year’s event is shaping up to be one of the best ever for new outdoor gear, features, seminar leaders, fishing boats and specialty vendors, including many major company exhibits. "This is one of the nation’s premiere outdoor shows,” said Adam Starr, event manager for ShowSpan, Inc., which produces the show. "Besides West Michigan, show patrons come from throughout the state as well as Illinois, Indiana, Ohio and Ontario." Seminars: More than 100 free hunting and fishing seminars will be held on four stages, including Lake Ultimate, the 110,000-gallon indoor lake with fully rigged boats where fishing experts deliver real-time seminars. Headlining popular fee-based weekend Super Clinics are Mark Romanack and Johnny Candle for walleye, Dave Engel and Bill Bale for trout/salmon, and Don Watts for bass, which is new this year. Mark Martin, Denny Geurink and Lance Valentine are among many Michigan experts with national reputations. Deer-hunting expert Fred Abbas and Doc Morrow, food-plot specialist, will be on hand to impart their specialized knowledge, along with Ohio native Joe Thomas whose hunting and fishing seminars are a major draw. Local fishing guides will demonstrate their successful tactics on Lake Ultimate and other stages. Calling Competitions: The Grand Valley Chapter of the National Wild Turkey Federation will hose its annual Turkey Hunting Workshop from 10:00 a.m. to Noon on Saturday. The workshop and the 17th Annual Grand Rapids Open Turkey Calling Competition, that evening from 6:00 to 8:00 p.m., are both free with admission. Also on Saturday, the public is invited to compete and attend the 5th Annual Great Lakes Duck & Goose Calling Competition, presented by Ducks Unlimited. Amateur Division competition begins at 1:00 p.m., followed by Open Division competition about 3:00 p.m. Registration and more details are at www.callingducks.com. Stage Show Features: Between seminars, Lake Ultimate becomes a stage show. Former Detroit Tigers pitcher Milt Wilcox will host Ultimate Air Dogs, the Big Air show of leaping Labrador retrievers and other athletic canines. Wilcox will lead demonstrations in both distance jumping and extreme vertical leaping. The public is invited to register their dogs at www.ultimateairdogs.net. Big Buck Night West: Celebrity hosts Jimmy Gretzinger and Jenny Olson will host “Big Buck Night West” on Thursday at 7:00 p.m. Special guest Tony Gates of WLAV-FM will be on hand, too. The cameras will be taping for future Michigan Out-of-Doors TV programs. Special Features: Hundreds of professional mounts of birds, fish and game by members of the Michigan Taxidermist Association, which holds its annual convention during the show, will be on display at no charge for ticket-holders. The Woodland Woodcarvers return by popular demand. Grand River Fly Tyers, fish cleaning demonstrations by the Grand Rapids Steelheaders, and free fly casting instruction by Glen Blackwood of the Great Lakes Flyfishing Company are other popular features to return.